Considering that over 40% of South Africa’s listed REIT exposure is made up of offshore assets, it is rather strange that JSE-listed Emira are the first to invest in the United States of America. It is especially surprising considering the size of the market, the quality available and the US dollar appetite of investors worldwide. In a landmark acquisition completed last month (October 2017), Emira handed over R112 million for a minority stake (49%) in Belden Park Crossings shopping centre, located in North Canton, Ohio. A second payment of R178 million is said to follow and the second property for the payment being made, is still to be revealed. On the fourth point, the Belden Park Crossings shopping centre is said to deliver an initial 10.5% per annum US dollar-denominated return. Should this come to fruition, it will be particularly exciting, as shareholders have been limited to single-digit yields on the local asset component of the REIT’s portfolio. The transaction also leverages off the expertise of Rainier Companies (51% stakeholders in the property), a Dallas, Texas-based investment and real estate business, managed by Kenneth Dunn. Geoff Jennett, CEO of Emira feels there is much benefit to partnering with the Texas firm, going on record saying: "Rainier shares strong synergies with its South African counterpart. It is driven by a small entrepreneurial team and has built a successful 15-year track record as a skilled real estate investor and asset manager. Rainier currently has more than $1.5 billion property assets under management." That figure is almost triple the market capitalisation of Emira, which at close of trade on Friday, 3rd November was in the region of R6.97 billion (a little less than half a billion USD). 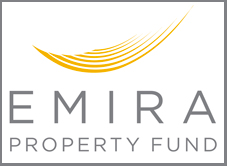 The initial ear-marked investments of R290 million constitutes roughly 2% of Emira’s total assets, and Jennett has indicated that as a result the transactions can be "comfortably" funded from the REIT’s own balance sheet. He also adds that management "can take advantage of access to relatively cheap, in-country, long-term debt finance." Start of a trend or a once-off? Many property portfolios have been diversifying exposure, taking on more and more offshore assets, especially in Eastern Europe. 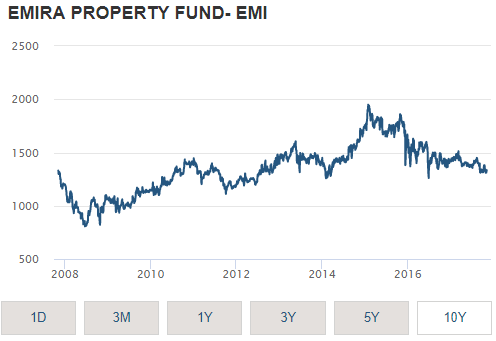 The trend is in full swing and judging by the comments made by Emira’s CEO, it appears that their 135-strong property portfolio will continue to grow its foreign exposure into the future. This latest transaction has added circa 33% (from 6% to 8% of total) to the existing offshore revenue column of the company. Initial plans are to grow the offshore revenue as a percentage of total revenue to at least 10%. Emira already have exposure to Australian Securities Exchange-listed Growthpoint Properties Australia (GOZ). According to Jennett, "GOZ has been a phenomenal investment for Emira for many reasons and, building on this, we have targeted further international diversification in developed markets." What has the share price done? Emira listed almost 14 years ago on 28 November 2003. Over the last 10 years the share price has not budged. Starting at R13.30 in the chart below (Tuesday, 6th November 2007), the share price ended on Friday, 3rd November at R13.34, almost exactly where it was a decade prior. In 2008, the astute trader could have picked up the share at around the R8.20 per share level and sold it around the R19 mark in January 2015. But to get that trade right as anyone who has invested for some time will know, would have been highly improbable. For the majority of buy-and-hold investors, this share has been a frustration for many years now.